Dubbed the most romantic city, Paris continues to draw an overwhelming number of tourists every year, and there is no sign of this pattern ending anytime soon. Regardless of when you are coming to Paris, it is important that you know the tipping etiquette. In this short guide, we go over the standard amounts that service workers in Paris are tipped. Take note that these are merely rough averages or common amounts, and you are always free to adjust on the basis of how satisfied you are with the service provided. In Paris, gratuity is included in the prices of all food and drink. This is as mandated by French law. Hence, service workers are already paid a decent wage and tips are by no means required or expected. 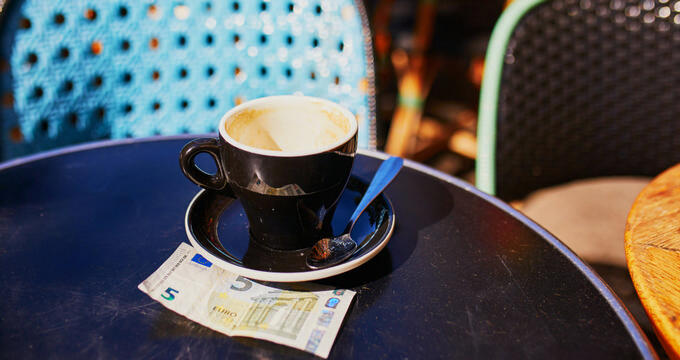 However, over the past few years, Paris service workers have become accustomed to receiving gratuity from guests and tourists and understand that tips are a sign of appreciation of good service. Therefore, travelers are still advised to tip only when provided exceptional service. This is opposite to the practice in the US and other tourist favorites, where tourists are pressured into tipping for nearly every service. If you are torn between not tipping versus the compulsory tipping that you are used to, simply round up your bill. Service workers in Paris and local tourists are used to this practice. In restaurants and cafes, patrons generally give tips amounting to 5% to 10% of the bill after receiving excellent treatment. This applies to all, from cheap eateries to fine dining restaurants. Leave a sizable tip whenever you have unusual requests or the staff goes out of their way to fulfill your needs; for example, they entertain your screaming child, clean up your spilled wine and broken wine glass, or translate an entire menu. In cafes, brasseries, and bars, rounding up is more common than leaving a tip separately, but feel free to tip the bartender if service is excellent. If you do decide to tip, do so per drink. One euro per drink will do for low- and middle-range places. In high-end bars with 15- to 20-euro drinks, tip 2 euros for each drink. Moreover, there are also some places where you can find tip jars. In these cases, you are under no obligation to tip. Sometimes, instead of calculating or estimating percentages, diners tip 1 to 2 euros for every 20 euros of the bill. There is no need to tip if your meal is quick and simple and need very little service. In most restaurants, tips are distributed among all employees. If you are dining as part of a large group, do consider tipping the restaurant nicely. After all, group meals can be challenging, especially for kitchen staff. In low- and mid-range hotels, tips are normally not given for coats. Those in nicer places, especially those with coat check attendants, are tipped 1 euro per coat. Doormen are commonly tipped 50 cents to 1 euro for tasks like hailing a cab or anything similar. Concierges who score hard-to-book reservations or tickets or go way out of their way to fulfill your requests deserve to be tipped. Guests do tip in cash and sometimes give gifts like chocolates or wine. Concierges in Paris are typically tipped 5 to 20 euros, depending on the difficulty of the request. You can give hotel porters 1 to 2 euros per bag, except if your bag is super heavy, in which case you might want to give more. And yes, porters do expect tips. Cab drivers in Paris do not need to be tipped, but passengers do commonly round up their fare. If the service has been outstanding, you can leave a 1 euro tip. Give 5% of the fare as tip if the driver also helps you with luggage and other tasks that are way outside their driving duties. Tour guides are always tipped. Ten to 10 euros is a good amount, but they will appreciate whatever they are given. Food delivery people in Paris are typically tipped 2 euros. Consider giving more during bad weather. Hairstylists are sometimes given 10% of the total bill in tips. In theatres, ushers are used to receiving tips of 1 euro per head on average. In general, service workers in Paris are not as dependent on tips as are their counterparts in other tourist-heavy cities in the world. Tips are appreciated but by no means required. Nonetheless, always reward exceptional service. In cash, don’t forget.